by Stephen Bouman, Ralston Deffenbaugh. Augsburg Fortress , 2009. Documented, undocumented, legal, or illegal . . . immigration is a controversial subject in the United States and consequently for congregations in the United States. 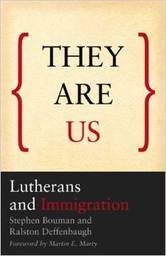 Stephen Bouman, former pastor and Evangelical Lutheran Congregations of America (ELCA) leader, and attorney and immigrant advocate Ralston Deffenbaugh, attempt to shed some light on the quandaries facing congregations and their members when it comes to understanding immigration from a Lutheran perspective. The authors accomplish this by first tracing immigration through the Bible and in history. They also offer a discussion of theological and cultural concerns related to immigration. It is likely that the authors’ Lutheran perspective will not wholly coincide with other Christian traditions; however, the subject matter is timely and pertinent for all congregations in the United States, and the authors’ discussion and reflection questions make this an especially helpful resource to use in Bible studies and small groups.